Licenses can be transferred to the Tier 1 Dongle for offline wiping. Bootable USB loaded with the WipeDrive software. Licenses can be transferred to the Tier 2 dongle for offline wiping. Log files can be saved directly to the dongle. What is the USB dongle for? Every time you wipe a hard drive, one usage license is deducted. If the computer you're wiping is connected to the internet, your licenses will be deducted directly from your cloud account code. If you don't have an Internet connection, you must transfer the licenses you want to use to your USB dongle and plug it into the computer you're wiping. The licenses will then be deducted directly from the USB dongle. Tier 1 dongles will only hold licenses. Our Tier 2 dongle has additional benefits. 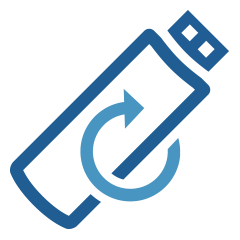 WipeDrive is installed on the Tier 2 dongle so you can boot directly from it, run the wipe, and save log files to the same dongle. For more details on how our dongle options differ or for help choosing the best solution for your organization, please contact your sales rep. at 801.224.2952.